The right to food is also implied in the 1945 Constitution, Article 28H on the right of everyone to live in physical and spiritual prosperity. It is also embodied in the Law on Food No. 18/2012 and, as Indonesia is a party to the ICESCR, in the Law No. 11 of 2005 on the Ratification of the ICESCR. The right to food embodies three main pillars, namely availability, accessibility and adequacy. Therefore, in order to guarantee the right of everyone’s to food, the three pillars shall be made the basis of the national implementation of the right to food. The country also faces the threat of frequent natural disasters. These challenges have made the strive to strengthen food security, end hunger and improve nutrition become crucial to be prioritized in the national development plan and implementation. General Comment No. 12/1999 on the right to adequate food, adopted by the Committee on Economic, Social and Cultural Rights. At the global stage, the SDGs Agenda has included the right to food as a stand-alone goal namely, Goal 2. 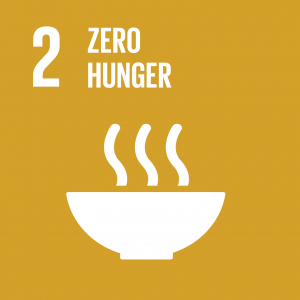 “End hunger, achieve food security and improved nutrition and promote sustainable agriculture.” The goal consists of eight targets ranging from ending hunger and malnutrition to agricultural productivity. While at the national level, the GoI has included five out of the eight global targets to be achieved by 2019.
c. Decreased proportion of people with calorie intake of less than 1400 kkal/kapita/day to 8.5% in 2019 (2015: 17,4%). f. Increased food consumption quality indicated by Desirable Dietary Pattern (PPH) to 92.5; and fish consumption rate to 54.5 kg/capita/year by 2019 (2015: 40,9 kg/capita/year). c. Developed agricultural and fishery sectors, particularly for poor farmers and fishermen. b. Developed programs and development in 1000 of Seed-Independent Villages by 2019.
d. 8% increase in foreign investment. The national targets reflects a great commitment to secure the availability of food, including by facilitating agricultural, farming and fishery equipment, although it is important to also make clear emphasis on the target groups to ensure that small-scale and poor farmers, fishermen and peasants are prioritized to receive the facilities. Moreover, a focus should also be brought on the capability of poor farmers, peasants and fishermen to sustain their lives, as it will also affect their capability to produce agricultural, farming and fish for greater food consumption. In the Agenda 6.7.1 of the RPJMN, the government is planning to open more access to agricultural finance for farmers, however, without taking into account the ability of small-scale farmers to provide their basic needs, it will be difficult for them to access such assistance or to keep a good credit performance. To this end, it is necessary to include an indicator on the average income of small-scale food producers to help the government to decide on the best interventions to improve the productivity of small-scale farmers. 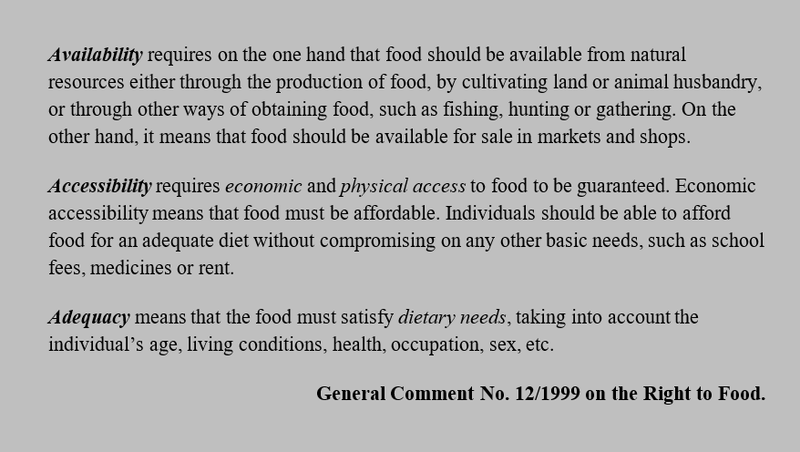 The ability of everyone to physically and economically to obtain food is an important indicator to assess the fulfillment of the right to adequate food by the government. FAO indicates that most of those who go hungry are to be found among poor consumers who, on average, spend 40% of their income to purchase food, while in Indonesia, the average spending on food are still at 46.45%, this means that most Indonesians are yet to be food secured. As volatile food prices can hamper food accessibility, especially for poor people, an indicator aims at measuring the market price of food is necessary to assess the functionality of food commodity market. Furthermore, as it has been previously mentioned, most people in Indonesia purchase their food in food markets, this also means that an indicator related to accessibility of food markets is also important, such as all-season cost of transportation to the nearest food market and the availability of all-seasons road to access food markets. With regard to adequacy, in order to have a more in-depth data on the real experience of the people about food accessibility, it will be very useful for the GoI to consider the indicator to assess the severity of food insecurity in the population, based on the Food Insecurity Experience Scale (FIES). The national targets have appropriately taken into account women and children in with regard to food adequacy, however there is no specific targets on other vulnerable groups such as indigenous peoples and people with disability. Therefore, it is important to also put specific indicators focusing on the availability of lands for indigenous groups to practice their traditional farming in relation to adequate access to food for them. There are approximately 24 million of people with disability in Indonesia, and many are living in poverty, in fact, people with disabilities in Indonesia are 30 to 50 percent more likely to be poor and unemployed, which also means experiencing food insecurity. In addition to economic incapable to purchase food, people with disability, particularly those with limited mobility, are difficult to access food markets to purchase food, resulting in a greater vulnerability in terms of accessing the right to adequate food. In light of the severe conditions that people with disability may deal with to access food, in comparison to those without disability, it is important to include indicators capturing the accessibility of food for disabled people. In light of the above gap analyses, we propose the following additional indicators to strengthen the impacts of the national development strategy to end hunger and strengthen food security. – Proportion of people exposed to public information and education campaigns (including school instruction) regarding nutrition and food safety. 2.2. End hunger and any types of malnutritions. a. Decreased prevalence of stunting (short and very short) among children under two years old to 22.8% by 2019 (2013: 32,9%);b. Decreased prevalence of wasting among children under five years old to 9.5% by 2019 (2013: 12%);c. Retained prevalence of obesity among children under five years old to 11.9% by 2019 (2013: 11,9%);d. Decreased prevalence of anemia among pregnant women to 28% by 2019 (2013: 37,1%);e. Increased percentage of infants under six month old to receive exclusive breastfeeding to 50% by 2019 (2013: 39%);f. Increased food consumption quality indicated by Desirable Dietary Pattern (PPH) to 92.5; and fish consumption rate to 54.5 kg/capita/year by 2019 (2015: 40,9 kg/capita/year). – Percentage of small-scale producers and indigenous people facilitated with agricultural/fishery equipments. – Food diversification policy in each region that is adapted to their respective sources. The UN Country system in Indonesia is committed to play a strong role to assist the GoI to achieve SDGs with three main modalities namely policy advocacy and advisory, capacity building and knowledge sharing. With regard to ending hunger, achieving food security and improving nutrition and promoting sustainable agriculture the GoI will benefit from close partnership with FAO and WFP to strengthen the capacity to implement all National targets regarding to the second goal of SDGs. Additionally, the UNICEF will also provide various technical assistance to ensure food security among children.